A comprehensive preparation supporting the health and rapid regeneration of joints and movement system! Powder form allows free choice of dose for the individual needs. Perfect choice for physically active people who lead extremely intense lifestyle. The highest quality active ingredients at optimal doses! 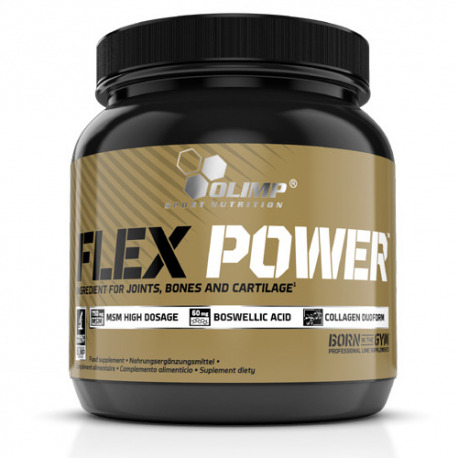 Olimp Flex Power was created for people who are physically active and obese, whose joints are subjected to increased loads. The formula is based on the highest quality active substances that have already been thoroughly tested. It will satisfy the most demanding athletes and people with a loaded camera movement. 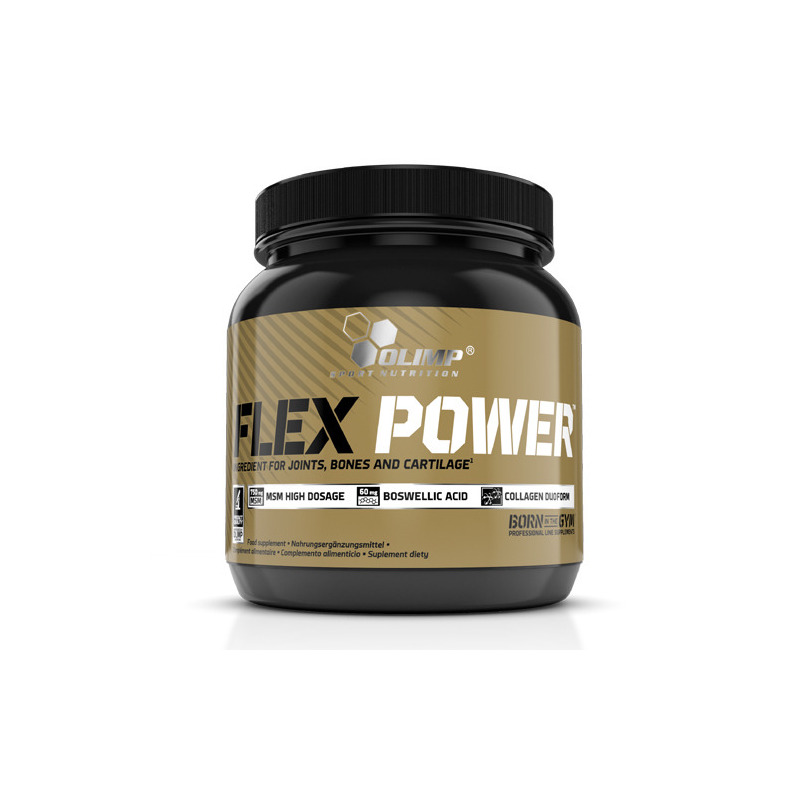 It helps maintain a proper state of articular cartilage. It is not a cure, but used during recovery supports its speed. The manufacturer has applied active ingredients with high standardization, a unique combination of active ingredients and refined taste (and solubility) make it an ideal choice for people who appreciate quality, efficiency and refined taste! Methylsulfonylmethane (MSM) affects the regeneration of epithelial tissue, muscle  totaling proper and cartilage, the severity of bone regeneration. Reducing the symptoms of inflammation. While the combination of glucosamine and chondroitin sulfate reduces symptoms of osteoarthritis . Moreover, it has beneficial effects on cartilage reconstruction and may inhibit the action of hyaluronidase - The enzyme responsible for cartilage degradation processes. Ingredients Vitamins & Mineral Pack provide vitamins and minerals that are necessary to maintain full health and quick regeneration of joints and respiratory movements. The formula contains calcium, witaminęD3, magnesium, vitamin C (as patented PureWay-C). All of these substances affect an extremely positive effect on the joints, but are also used in other areas thereby supporting the proper operation and health of the whole body. Hyaluronic acid: is one of the major components of connective tissue, mainly joint tissue. Boswellia serrata extract: with 60% contents of boswellic acid - acts as an auxiliary to maintain flexibility and comfort of the joints . It affects the proper maintenance of the body's anti-inflammatory properties by reducing the activity of pro-inflammatory mediators . 1 serving daily between meals. 1 serving (14.4 g powder = 2 scoops) in 200 ml of water. Consume immediately after preparation. Do not exceed recommended servings for consumption during the day. Food supplements should not be used as a substitute for a varied diet. A balanced diet and a healthy lifestyle. Ingredients: 69% type I collagen hydrolyzate, acidity regulators - citric acid, sodium citrate; 5.2% methylsulfonylmethane (MSM), flavors, 3.5% glucosamine sulfate 2KCl (shellfish), anti-caking agent - silicon dioxide; 2.1% calcium carbonate, 1.7% of hydrolysed type II collagen, chondroitin sulfate, 1.0%, 0.83% microencapsulated L-ascorbic acid (PureWay-C) - vit. C, 0.69% extract from Boswellia serrata gum, 0.66% magnesium oxide, sweeteners - acesulfame K, sucralose; 0.14% sodium hyaluronate, 0.04% cholecalciferol - vitamin D3; paints - carotene (A), carmine (B), riboflavin (C), E 150c (D), E 150d (E), E 133 (F), patent blue V (G), indigo (H), chlorophylls and chlorophyllin (I), curcumin (J), anthocyanins (K), paprika extract (L), betanin (M), vegetable carbon (N). (A) - (Z) - Depending on the taste of the product symbol (A-Z) component used is located next to the date of minimum durability (best before).